I was told that 10 would be enough, so the last six got finished yesterday. The first four were shown here. Blanks are constructed by Joe Schneider (Wood128), placement and end caps are my contribution. Last picture is of the complete order. WOW !!! WOW !! 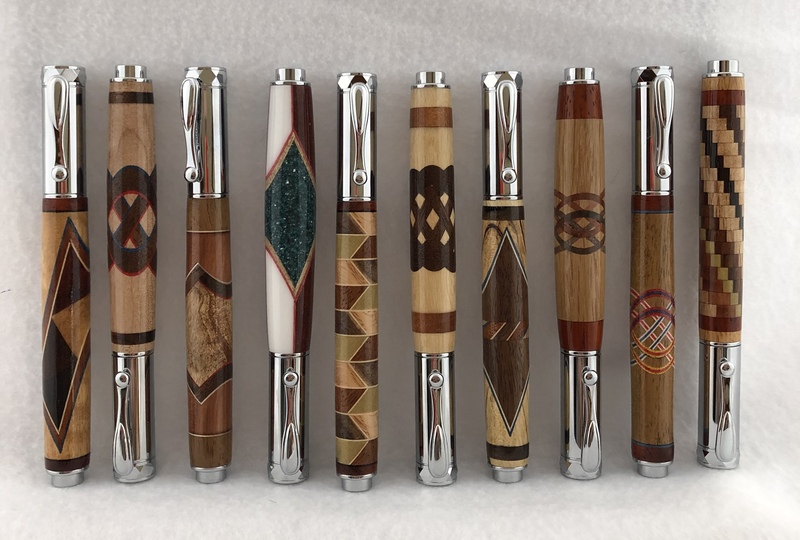 You have done a wonderful job using my segmented blanks to make those 10 beautiful pens. Good idea for adding the end caps to the desired size. I did not realize that you had purchased that many of my blanks ......what 3 years ago ? Mark can make all these blanks if he so desires. How did you like the one with the Corian inlay ? Hi Joe. Interesting story. There are four blanks in my stash from you that I did not purchase from you directly, or Exotics. Several years ago I saw another vendor (I will not name - seldom on IAP) who had obviously bought them, and was reselling them. That did not bother me. What bothered me was that they were not giving you credit as the maker. It was implied that they made them. That really pis..d me off - so I bought them all! But I believe I still have 18 more of your blanks. 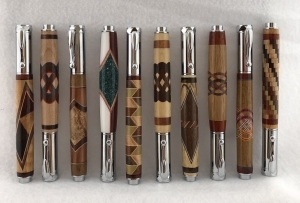 There was no way I could have made 10 segmented blanks, and finished pens in 2 days, so into my stash I went. To be honest, it was hard to part with the diagonal diamond and the centered diamond ones - those were my favorite - last picture, left to right #1, #3, #4, #7. But, they are gifts from my wife to colleagues as departing gifts. (After 30 years with her company, 9 patents and over 150 invention records - she's being forced to retire). The corian was spot on for alignment as you constructed. It also fit the Zen perfectly, so no need for end caps to center the pattern. During drilling I cooled the bit down with water, but it went fine. It turned easily, but I did use a fair bit of CA during the turning process just to make sure it held together. One nice thing about using someone else's blanks; after getting my "feet wet" with segmenting, I really appreciate your accuracy and combination of materials and colors. These were a joy to make. Superb work, Mark !!!!! .. Thanks for showing !! I envy the recipient of every one of those pens !!!! Last edited by magpens; 03-22-2019 at 05:54 PM. I feel that I also want to acknowledge the creative vision of Joe S. in creating the segmented blanks that were the starting point for Mark !! VERY well done, Joe !!! Last edited by magpens; 03-22-2019 at 05:53 PM. Awesome blanks but the fitting and finishing aren't too shabby either. You're wife sounds like a very impressive lady too and I wish her well in retirement. There is life after retirement and it is what you make of it. 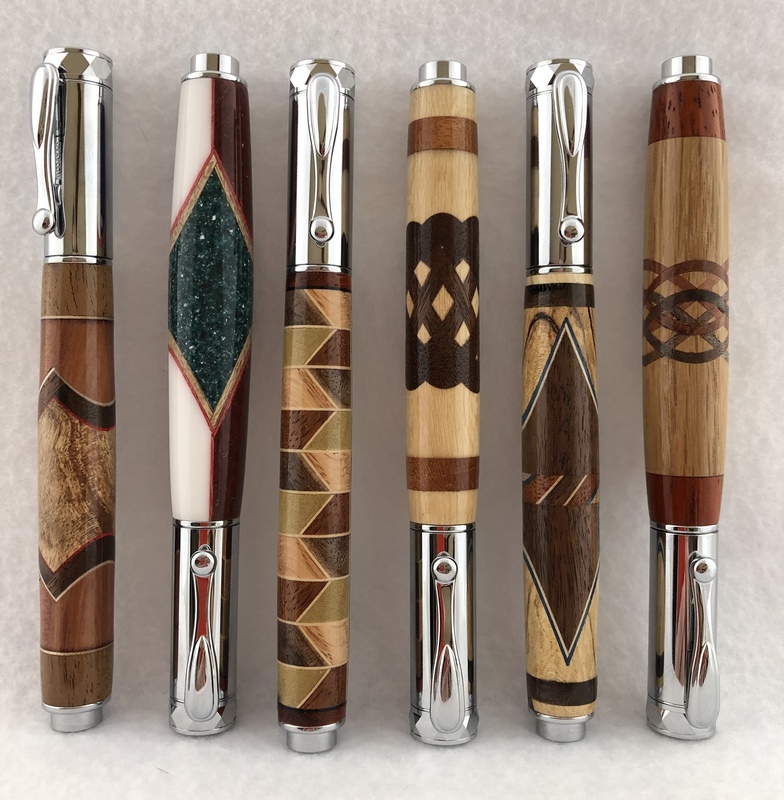 I took my hobby, knife making, and turned it into a very small business that led into getting back into turning which has expanded the business just a little bit more. I'm sure with your wife's drive(9 patents, wow!) she will do well and will probably spend some time in the shop with you. Maybe she'll invent some type of new pen and start that process. You never know what the future holds. Last edited by wolf creek knives; 03-23-2019 at 11:05 AM. I've been looking at Joe's segmented blanks, trying to decide which to get started with. So many blanks, so little time !